We have seen several topics regarding the web server and decided to make a combined topic for that (we are closing the other ones). Now to start let's go over what's needed to make it function. 2) FSX needs to be running, one of the busses loaded. 3) The connector needs to running. When it finds the webserver running in FSX it will be green and show the IP. 4) Hopefully you will see a firewall message (of course you need to allow access), if you do not your system is not running any firewall on outgoing connections and from a security and privacy aspect that's bad. 5) Clicking on the green IP address should open your browser. Of course you can do that from any device with a web browser on the same network. It's best to check on the same system first, if that works and it does not want to connect to your iPad you know it is not the bus webserver but the connection between the two devices. 6) If your aircraft is moving you will see the data change. Click on pause to pause the sim. If this all works you know you got a good connection to the web server. You can use this simple screen to monitor your flight from your phone. etc. Now a lot of things can go wrong when you are using this kind of technology, for example people using TCP/IP Version 6 will probably have problems. I also have problems because I got two network cards and two Ip addresses and FS only seems to want to connect to one of them. But overall it should work. We have identified a possible issue that we are currently working on. But if it does not function do drop us a post here so we know the scale of the issue. If you are not able to connect there is one thing you must check. We are not sure how and why but it seems a parameter can be wrong in an ini file. Check the FMGS.ini file in the documents\aerosoft\airbus folder. If HTML_Interface is set to 0 it most likely will be the reason for problems. Just edit it to 1. 5) I made the test you suggested: NO JOY neither on my pc, or my laptop installations. I still have perfectly working the first page with fly data and the working possibility to PAUSE or RESUME simulator status, but if I try to open the MCDU page I keep on obtaining an OFF MCDU. Black display and inop keys. Obviously, as there is the issue on the very same system, any attempt to open that IP from the browser on an external device as my iPad is totally useless. I found on both installations my FMGS.ini files with this parameter set to ZERO, as you say. I just did edit to "1", but without any positive effect. [08/05/2015 20:55:06:135]: Gauge loaded: 2. [08/05/2015 20:55:06:135]: Info: 0, 0, size=0x0de70000. [08/05/2015 20:55:06:135]: Module version: 1, 2, 7, 82. Date/time: N/A. [08/05/2015 20:55:06:135]: GDI+: EncoderClsid 4. [08/05/2015 20:55:06:135]: PIPE: The named pipe, \\.\pipe\MCDU_Input, is created. [08/05/2015 20:55:06:136]: PIPE: The named pipe, \\.\pipe\FBW_DataExchange, is created. [08/05/2015 20:55:06:136]: UpdateTh started: 0. [08/05/2015 20:55:06:256]: PIPE: Connected to the client. [08/05/2015 20:55:06:546]: PIPE: 1 packets. [61, 351, 3] [0,1,-0.0] FM= 0.00, 0.00. [08/05/2015 20:55:34:694]: PIPE: 501 packets. [18, 351, 3] [3,1, 0.0] FM= 0.00, 0.00. [08/05/2015 20:55:55:225]: PIPE: 1001 packets. [19, 351, 2] [11,1,-0.0] FM= 0.00, 0.00. [08/05/2015 20:56:18:396]: PIPE: 1501 packets. [21, 351, 2] [17,1,-0.0] FM= 0.00, 0.00. [08/05/2015 20:56:39:509]: PIPE: 2001 packets. [23, 351, 1] [19,1,-0.0] FM= 0.00, 0.00. [08/05/2015 20:56:53:649]: PIPE: 2501 packets. [24, 351, 1] [19,1,-0.0] FM= 0.00, 0.00. [08/05/2015 20:57:06:936]: PIPE: 3001 packets. [25, 351, 1] [19,1,-0.0] FM= 0.00, 0.00. [08/05/2015 20:57:19:868]: LNav mode: 0 off. [08/05/2015 20:57:20:022]: PIPE: 3501 packets. [26, 351, 0] [19,1, 0.0] FM= 0.00, 0.00. [08/05/2015 20:57:38:531]: PIPE: 4001 packets. [27, 351, 0] [19,1,-0.0] FM= 0.00, 0.00. [08/05/2015 20:57:54:037]: PIPE: 4501 packets. [28, 351, 0] [19,1, 0.0] FM= 0.00, 0.00. [08/05/2015 20:58:13:255]: PIPE: 5001 packets. [29, 351, 0] [19,1, 0.0] FM= 0.00, 0.00. [08/05/2015 20:58:26:854]: PIPE: 5501 packets. [31, 351, 0] [19,1,-0.0] FM= 0.00, 0.00. [08/05/2015 20:58:41:518]: PIPE: 6001 packets. [32, 351, 0] [19,1, 0.0] FM= 0.00, 0.00. [08/05/2015 20:59:03:641]: PIPE: 6501 packets. [33, 351, 0] [19,1,-0.0] FM= 0.00, 0.00. [08/05/2015 20:59:26:354]: PIPE: 7001 packets. [34, 351, 0] [19,1, 0.0] FM= 0.00, 0.00. [08/05/2015 20:59:49:325]: PIPE: 7501 packets. [34, 351, 0] [19,1, 0.0] FM= 0.00, 0.00. [08/05/2015 21:00:12:378]: PIPE: 8001 packets. [34, 351, 0] [19,1,-0.0] FM= 0.00, 0.00. [08/05/2015 21:00:35:540]: UpdateTh finished: 0, 1. [08/05/2015 21:00:35:561]: Gauge unloaded 1. 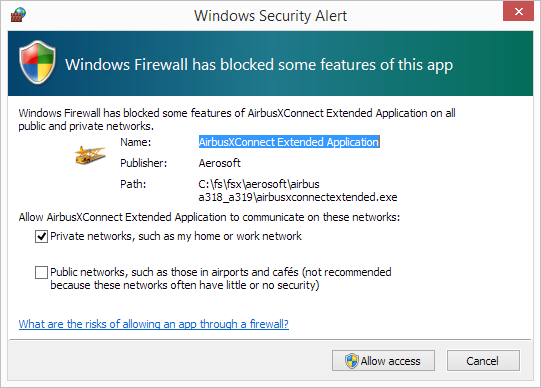 Roberto, can you post the content of the AirbusXConnectExtended.log? Just send it to support@aerosoft.com and write that it should be forward to me. Done! I recreated the situation by logging everything and I sent all related files. I am also running into issues when trying to connect to the A319 using either my iPad or my PC. I had to enable port forwarding to get my iPad to work, so I thought that might have something to do with it, but it also happens on the PC on which Prepar3d is running. In both cases I get the following errors in the log file. Thanks for taking a look. [11/05/2015 14:46:14:620]: Info: 0, 1, size=0x00000000. [11/05/2015 14:46:14:620]: Module version: . Date/time: N/A. [11/05/2015 14:46:15:622]: Result of <ATDD: TITLE>: 0. [11/05/2015 14:46:15:622]: Result of <ATDD: Flight1>: 0. [11/05/2015 14:46:15:622]: Result of <ATDD: Flight2>: 0. [11/05/2015 14:46:15:622]: Result of <ATDD: Flight3>: 0. [11/05/2015 14:46:15:622]: Result of <ATDD: Flight4>: 0. [11/05/2015 14:46:15:622]: Result of <ATDD: Flight5>: 0. [11/05/2015 14:46:15:622]: Result of <ATDD: Flight6>: 0. [11/05/2015 14:46:15:622]: Result of <ATDD: Flight7>: 0. [11/05/2015 14:46:15:623]: Result of <ATDD: Flight8>: 0. [11/05/2015 14:46:15:623]: Result of <RDOS: Fuel>: 0. [11/05/2015 14:46:15:623]: SimConnect thread started. [11/05/2015 14:46:15:623]: Result of <SubscribeToSystemEvent2>: 0. [11/05/2015 14:46:15:623]: Result of <CallDispatch> changed to: 0x0. [11/05/2015 14:46:15:623]: Webserver (main) thread started. [11/05/2015 14:46:15:625]: [Event]: Sim pause state: 0. [11/05/2015 14:46:16:346]: [Event]: Flight data received: IAS=0 Kts; Mach=0.02 M; Alt=825 Ft; Hdg=11; Distance=0.00 NM; CurrentFuelTotal=5337 LBS; Ground speed=0 Kts; Vert speed=0.00 feet/sec; NextWP=. [11/05/2015 14:46:26:349]: [Event]: Flight data received: IAS=0 Kts; Mach=0.02 M; Alt=825 Ft; Hdg=11; Distance=0.00 NM; CurrentFuelTotal=5337 LBS; Ground speed=0 Kts; Vert speed=0.00 feet/sec; NextWP=. [11/05/2015 14:46:36:377]: [Event]: Flight data received: IAS=0 Kts; Mach=0.01 M; Alt=835 Ft; Hdg=11; Distance=0.00 NM; CurrentFuelTotal=5337 LBS; Ground speed=0 Kts; Vert speed=0.00 feet/sec; NextWP=. [11/05/2015 14:46:45:991]: Failed to open image file: G:\Documents\Aerosoft\Airbus\MCDU_Dspl.png. [11/05/2015 14:46:46:376]: [Event]: Flight data received: IAS=0 Kts; Mach=0.01 M; Alt=835 Ft; Hdg=11; Distance=0.00 NM; CurrentFuelTotal=5337 LBS; Ground speed=0 Kts; Vert speed=0.00 feet/sec; NextWP=. [11/05/2015 14:46:46:991]: Failed to open image file: G:\Documents\Aerosoft\Airbus\MCDU_Dspl.png. [11/05/2015 14:46:56:343]: [Event]: Flight data received: IAS=0 Kts; Mach=0.01 M; Alt=835 Ft; Hdg=11; Distance=0.00 NM; CurrentFuelTotal=5337 LBS; Ground speed=0 Kts; Vert speed=0.00 feet/sec; NextWP=. [11/05/2015 14:47:06:299]: [Event]: Flight data received: IAS=0 Kts; Mach=0.01 M; Alt=835 Ft; Hdg=11; Distance=0.00 NM; CurrentFuelTotal=5337 LBS; Ground speed=0 Kts; Vert speed=0.00 feet/sec; NextWP=. [11/05/2015 14:47:07:272]: Failed to open image file: G:\Documents\Aerosoft\Airbus\MCDU_Dspl.png. [11/05/2015 14:47:07:273]: Failed to open image file: G:\Documents\Aerosoft\Airbus\MCDU_Dspl.png. [11/05/2015 14:47:07:274]: Failed to open image file: G:\Documents\Aerosoft\Airbus\MCDU_Dspl.png. [11/05/2015 14:47:07:368]: Failed to open image file: G:\Documents\Aerosoft\Airbus\MCDU_Dspl.png. [11/05/2015 14:47:11:835]: Failed to open image file: G:\Documents\Aerosoft\Airbus\MCDU_Dspl.png. [11/05/2015 14:47:14:629]: Failed to open image file: G:\Documents\Aerosoft\Airbus\MCDU_Dspl.png. [11/05/2015 14:47:16:304]: [Event]: Flight data received: IAS=0 Kts; Mach=0.01 M; Alt=835 Ft; Hdg=11; Distance=0.00 NM; CurrentFuelTotal=5337 LBS; Ground speed=0 Kts; Vert speed=0.00 feet/sec; NextWP=. [11/05/2015 14:47:22:993]: Failed to open image file: G:\Documents\Aerosoft\Airbus\MCDU_Dspl.png. [11/05/2015 14:47:23:084]: Failed to open image file: G:\Documents\Aerosoft\Airbus\MCDU_Dspl.png. [11/05/2015 14:47:23:180]: Failed to open image file: G:\Documents\Aerosoft\Airbus\MCDU_Dspl.png. [11/05/2015 14:47:26:374]: [Event]: Flight data received: IAS=0 Kts; Mach=0.01 M; Alt=835 Ft; Hdg=11; Distance=0.00 NM; CurrentFuelTotal=5337 LBS; Ground speed=0 Kts; Vert speed=0.00 feet/sec; NextWP=. [11/05/2015 14:47:31:023]: Failed to open image file: G:\Documents\Aerosoft\Airbus\MCDU_Dspl.png. [11/05/2015 14:47:35:015]: Failed to open image file: G:\Documents\Aerosoft\Airbus\MCDU_Dspl.png. [11/05/2015 14:47:35:114]: Failed to open image file: G:\Documents\Aerosoft\Airbus\MCDU_Dspl.png. [11/05/2015 14:47:35:209]: Failed to open image file: G:\Documents\Aerosoft\Airbus\MCDU_Dspl.png. [11/05/2015 14:47:35:304]: Failed to open image file: G:\Documents\Aerosoft\Airbus\MCDU_Dspl.png. [11/05/2015 14:47:36:345]: [Event]: Flight data received: IAS=0 Kts; Mach=0.01 M; Alt=835 Ft; Hdg=11; Distance=0.00 NM; CurrentFuelTotal=5337 LBS; Ground speed=0 Kts; Vert speed=0.00 feet/sec; NextWP=. [11/05/2015 14:47:46:346]: [Event]: Flight data received: IAS=0 Kts; Mach=0.01 M; Alt=835 Ft; Hdg=11; Distance=0.00 NM; CurrentFuelTotal=5337 LBS; Ground speed=0 Kts; Vert speed=0.00 feet/sec; NextWP=. [11/05/2015 14:47:56:376]: [Event]: Flight data received: IAS=0 Kts; Mach=0.01 M; Alt=835 Ft; Hdg=11; Distance=0.00 NM; CurrentFuelTotal=5337 LBS; Ground speed=0 Kts; Vert speed=0.00 feet/sec; NextWP=. [11/05/2015 14:48:03:002]: Connection closed: 0. [11/05/2015 14:48:03:002]: SimConnect thread finished. Utexgrad, you have checked this: http://forum.aerosoft.com/index.php?/topic/95074-mcdu-via-webserver-combination-topic/?p=677781 ? Mathijs, the URL links back to this thread. I am having the same issue as utexgrad. Running FSX Steam edition, Airbus x 320/321 1.3 Hotfix e.
I can interact with the sim (pausing and resuming), but MCDU shows no content and the MCDU_Dspl.png is not in Documents\Aerosoft\Airbus. Tried uninstalling/reinstalling with no success. What is interesting though is, that it used to work on AS_AIRBUS-A320-A321_FSX-P3D_V121. I have reinstalled this version, but that didn't help it either. 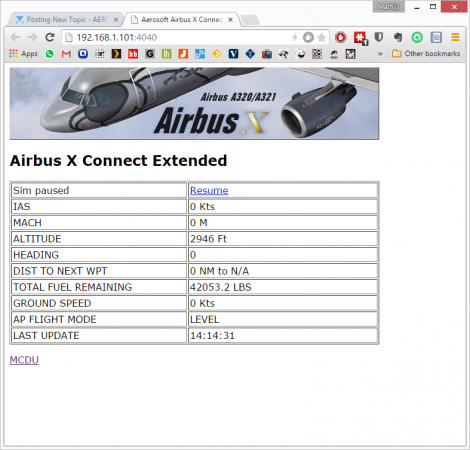 Below the content of the AirbusXConnectExtended.log. Please advise if you need further information. [15/05/2015 14:02:17:793]: Info: 0, 1, size=0x00000000. [15/05/2015 14:02:17:793]: Module version: . Date/time: N/A. [15/05/2015 14:02:18:779]: Result of <ATDD: TITLE>: 0. [15/05/2015 14:02:18:779]: Result of <ATDD: Fuel1>: 0. [15/05/2015 14:02:18:779]: Result of <ATDD: Fuel2>: 0. [15/05/2015 14:02:18:779]: Result of <ATDD: Fuel3>: 0. [15/05/2015 14:02:18:779]: Result of <ATDD: Payload0>: 0. [15/05/2015 14:02:18:779]: Result of <ATDD: Payload1>: 0. [15/05/2015 14:02:18:779]: Result of <ATDD: Payload2>: 0. [15/05/2015 14:02:18:779]: Result of <ATDD: Payload3>: 0. [15/05/2015 14:02:18:779]: Result of <ATDD: Flight1>: 0. [15/05/2015 14:02:18:779]: Result of <ATDD: Flight2>: 0. [15/05/2015 14:02:18:779]: Result of <ATDD: Flight3>: 0. [15/05/2015 14:02:18:780]: Result of <ATDD: Flight4>: 0. [15/05/2015 14:02:18:780]: Result of <ATDD: Flight5>: 0. [15/05/2015 14:02:18:780]: Result of <ATDD: Flight6>: 0. [15/05/2015 14:02:18:780]: Result of <ATDD: Flight7>: 0. [15/05/2015 14:02:18:780]: Result of <ATDD: Flight8>: 0. [15/05/2015 14:02:18:780]: Result of <RDOS: Fuel>: 0. [15/05/2015 14:02:18:780]: SimConnect thread started. [15/05/2015 14:02:18:780]: [15/05/2015 14:02:18:780]: Webserver (main) thread started. [15/05/2015 14:02:18:780]: Result of <CallDispatch> changed to: 0x0. [15/05/2015 14:02:18:814]: [Event]: Sim pause state: 0. [15/05/2015 14:02:18:967]: [Event]: Fuel data received: Left=26.537 pct; Right=26.573 pct; Center=87.592 pct. [15/05/2015 14:02:18:967]: [Event]: Flight data received: IAS=0 Kts; Mach=0.01 M; Alt=2103 Ft; Hdg=25; Distance=54.46 NM; CurrentFuelTotal=20127 LBS; Ground speed=0 Kts; Vert speed=0.00 feet/sec; NextWP=GDV. [15/05/2015 14:02:28:923]: [Event]: Fuel data received: Left=26.537 pct; Right=26.573 pct; Center=87.592 pct. [15/05/2015 14:02:28:923]: [Event]: Flight data received: IAS=0 Kts; Mach=0.00 M; Alt=2108 Ft; Hdg=25; Distance=54.46 NM; CurrentFuelTotal=20127 LBS; Ground speed=0 Kts; Vert speed=0.00 feet/sec; NextWP=GDV. [15/05/2015 14:02:38:863]: [Event]: Fuel data received: Left=26.537 pct; Right=26.573 pct; Center=87.592 pct. [15/05/2015 14:02:38:863]: [Event]: Flight data received: IAS=0 Kts; Mach=0.00 M; Alt=2113 Ft; Hdg=25; Distance=54.46 NM; CurrentFuelTotal=20127 LBS; Ground speed=0 Kts; Vert speed=0.00 feet/sec; NextWP=GDV. [15/05/2015 14:02:48:867]: [Event]: Fuel data received: Left=26.537 pct; Right=26.573 pct; Center=87.592 pct. [15/05/2015 14:02:48:867]: [Event]: Flight data received: IAS=0 Kts; Mach=0.01 M; Alt=2118 Ft; Hdg=25; Distance=54.46 NM; CurrentFuelTotal=20127 LBS; Ground speed=0 Kts; Vert speed=0.00 feet/sec; NextWP=GDV. [15/05/2015 14:02:58:961]: [Event]: Fuel data received: Left=26.537 pct; Right=26.573 pct; Center=87.592 pct. [15/05/2015 14:02:58:961]: [Event]: Flight data received: IAS=0 Kts; Mach=0.01 M; Alt=2123 Ft; Hdg=25; Distance=54.46 NM; CurrentFuelTotal=20127 LBS; Ground speed=0 Kts; Vert speed=0.00 feet/sec; NextWP=GDV. [15/05/2015 14:03:08:872]: [Event]: Fuel data received: Left=26.537 pct; Right=26.573 pct; Center=87.592 pct. [15/05/2015 14:03:08:872]: [Event]: Flight data received: IAS=0 Kts; Mach=0.00 M; Alt=2128 Ft; Hdg=25; Distance=54.46 NM; CurrentFuelTotal=20127 LBS; Ground speed=0 Kts; Vert speed=0.00 feet/sec; NextWP=GDV. [15/05/2015 14:03:18:898]: [Event]: Fuel data received: Left=26.537 pct; Right=26.573 pct; Center=87.592 pct. [15/05/2015 14:03:18:898]: [Event]: Flight data received: IAS=0 Kts; Mach=0.01 M; Alt=2133 Ft; Hdg=25; Distance=54.46 NM; CurrentFuelTotal=20127 LBS; Ground speed=0 Kts; Vert speed=0.00 feet/sec; NextWP=GDV. [15/05/2015 14:03:26:268]: Socket accepted: 0x494. [15/05/2015 14:03:26:550]: Webserver (CurrentRequest) thread started. [15/05/2015 14:03:26:551]: Webserver (CurrentRequest) thread finished. [15/05/2015 14:03:26:551]: Socket accepted: 0x494. [15/05/2015 14:03:26:824]: Webserver (CurrentRequest) thread started. [15/05/2015 14:03:26:838]: Webserver (CurrentRequest) thread finished. [15/05/2015 14:03:26:903]: Socket accepted: 0x494. [15/05/2015 14:03:26:903]: Webserver (CurrentRequest) thread started. [15/05/2015 14:03:26:903]: Webserver (CurrentRequest) thread finished. [15/05/2015 14:03:28:881]: [Event]: Fuel data received: Left=26.537 pct; Right=26.573 pct; Center=87.592 pct. [15/05/2015 14:03:28:881]: [Event]: Flight data received: IAS=0 Kts; Mach=0.01 M; Alt=2138 Ft; Hdg=25; Distance=54.46 NM; CurrentFuelTotal=20127 LBS; Ground speed=0 Kts; Vert speed=0.00 feet/sec; NextWP=GDV. [15/05/2015 14:03:38:905]: [Event]: Fuel data received: Left=26.537 pct; Right=26.573 pct; Center=87.592 pct. [15/05/2015 14:03:38:905]: [Event]: Flight data received: IAS=0 Kts; Mach=0.00 M; Alt=2143 Ft; Hdg=25; Distance=54.46 NM; CurrentFuelTotal=20127 LBS; Ground speed=0 Kts; Vert speed=0.00 feet/sec; NextWP=GDV. [15/05/2015 14:03:40:096]: Socket accepted: 0x4A0. [15/05/2015 14:03:40:110]: Webserver (CurrentRequest) thread started. [15/05/2015 14:03:40:111]: Webserver (CurrentRequest) thread finished. [15/05/2015 14:03:40:185]: [Event]: Sim pause state: 1. [15/05/2015 14:03:41:141]: Socket accepted: 0x4A4. [15/05/2015 14:03:41:141]: Webserver (CurrentRequest) thread started. [15/05/2015 14:03:41:142]: Webserver (CurrentRequest) thread finished. [15/05/2015 14:03:41:203]: Socket accepted: 0x4A4. [15/05/2015 14:03:41:203]: Webserver (CurrentRequest) thread started. [15/05/2015 14:03:41:204]: Webserver (CurrentRequest) thread finished. [15/05/2015 14:03:47:697]: Socket accepted: 0x4A0. [15/05/2015 14:03:47:697]: Webserver (CurrentRequest) thread started. [15/05/2015 14:03:47:698]: Webserver (CurrentRequest) thread finished. [15/05/2015 14:03:47:727]: [Event]: Sim pause state: 0. [15/05/2015 14:03:48:731]: Socket accepted: 0x428. [15/05/2015 14:03:48:731]: Webserver (CurrentRequest) thread started. [15/05/2015 14:03:48:732]: Webserver (CurrentRequest) thread finished. [15/05/2015 14:03:48:790]: Socket accepted: 0x494. [15/05/2015 14:03:48:790]: Webserver (CurrentRequest) thread started. [15/05/2015 14:03:48:791]: Webserver (CurrentRequest) thread finished. [15/05/2015 14:03:48:879]: [Event]: Fuel data received: Left=26.537 pct; Right=26.573 pct; Center=87.592 pct. [15/05/2015 14:03:48:879]: [Event]: Flight data received: IAS=0 Kts; Mach=0.00 M; Alt=2144 Ft; Hdg=25; Distance=54.46 NM; CurrentFuelTotal=20127 LBS; Ground speed=0 Kts; Vert speed=0.00 feet/sec; NextWP=GDV. [15/05/2015 14:03:50:808]: Socket accepted: 0x4AC. [15/05/2015 14:03:50:808]: Webserver (CurrentRequest) thread started. [15/05/2015 14:03:50:808]: Webserver (CurrentRequest) thread finished. [15/05/2015 14:03:50:852]: Socket accepted: 0x494. [15/05/2015 14:03:50:852]: Webserver (CurrentRequest) thread started. [15/05/2015 14:03:50:853]: Webserver (CurrentRequest) thread finished. [15/05/2015 14:03:50:894]: Socket accepted: 0x3A8. [15/05/2015 14:03:50:895]: Webserver (CurrentRequest) thread started. [15/05/2015 14:03:50:906]: Webserver (CurrentRequest) thread finished. [15/05/2015 14:03:50:906]: Socket accepted: 0x3A8. [15/05/2015 14:03:50:906]: Webserver (CurrentRequest) thread started. [15/05/2015 14:03:50:907]: Failed to open image file: C:\Users\gd\Documents\Aerosoft\Airbus\MCDU_Dspl.png. [15/05/2015 14:03:50:907]: Webserver (CurrentRequest) thread finished. [15/05/2015 14:03:50:924]: Socket accepted: 0x4A0. [15/05/2015 14:03:50:925]: Webserver (CurrentRequest) thread started. [15/05/2015 14:03:50:925]: Failed to open image file: C:\Users\gd\Documents\Aerosoft\Airbus\MCDU_Dspl.png. [15/05/2015 14:03:50:926]: Webserver (CurrentRequest) thread finished. [15/05/2015 14:03:51:038]: Socket accepted: 0x41C. [15/05/2015 14:03:51:038]: Webserver (CurrentRequest) thread started. [15/05/2015 14:03:51:038]: Failed to open image file: C:\Users\gd\Documents\Aerosoft\Airbus\MCDU_Dspl.png. [15/05/2015 14:03:51:039]: Webserver (CurrentRequest) thread finished. [15/05/2015 14:03:51:082]: Socket accepted: 0x4AC. [15/05/2015 14:03:51:082]: Webserver (CurrentRequest) thread started. [15/05/2015 14:03:51:083]: Failed to open image file: C:\Users\gd\Documents\Aerosoft\Airbus\MCDU_Dspl.png. [15/05/2015 14:03:51:083]: Webserver (CurrentRequest) thread finished. [15/05/2015 14:03:51:127]: Socket accepted: 0x38C. [15/05/2015 14:03:51:127]: Webserver (CurrentRequest) thread started. [15/05/2015 14:03:51:127]: Failed to open image file: C:\Users\gd\Documents\Aerosoft\Airbus\MCDU_Dspl.png. [15/05/2015 14:03:51:127]: Webserver (CurrentRequest) thread finished. [15/05/2015 14:03:51:171]: Socket accepted: 0x38C. [15/05/2015 14:03:51:171]: Webserver (CurrentRequest) thread started. [15/05/2015 14:03:51:171]: Failed to open image file: C:\Users\gd\Documents\Aerosoft\Airbus\MCDU_Dspl.png. [15/05/2015 14:03:51:171]: Webserver (CurrentRequest) thread finished. [15/05/2015 14:03:51:215]: Socket accepted: 0x41C. [15/05/2015 14:03:51:215]: Webserver (CurrentRequest) thread started. [15/05/2015 14:03:51:215]: Failed to open image file: C:\Users\gd\Documents\Aerosoft\Airbus\MCDU_Dspl.png. [15/05/2015 14:03:51:215]: Webserver (CurrentRequest) thread finished. [15/05/2015 14:03:51:259]: Socket accepted: 0x41C. [15/05/2015 14:03:51:259]: Webserver (CurrentRequest) thread started. [15/05/2015 14:03:51:259]: Failed to open image file: C:\Users\gd\Documents\Aerosoft\Airbus\MCDU_Dspl.png. [15/05/2015 14:03:51:259]: Webserver (CurrentRequest) thread finished. [15/05/2015 14:03:51:307]: Socket accepted: 0x4A0. [15/05/2015 14:03:51:307]: Webserver (CurrentRequest) thread started. [15/05/2015 14:03:51:307]: Failed to open image file: C:\Users\gd\Documents\Aerosoft\Airbus\MCDU_Dspl.png. [15/05/2015 14:03:51:308]: Webserver (CurrentRequest) thread finished. [15/05/2015 14:03:51:351]: Socket accepted: 0x3A8. [15/05/2015 14:03:51:351]: Webserver (CurrentRequest) thread started. [15/05/2015 14:03:51:351]: Failed to open image file: C:\Users\gd\Documents\Aerosoft\Airbus\MCDU_Dspl.png. [15/05/2015 14:03:51:351]: Webserver (CurrentRequest) thread finished. [15/05/2015 14:03:51:395]: Socket accepted: 0x41C. [15/05/2015 14:03:51:395]: Webserver (CurrentRequest) thread started. [15/05/2015 14:03:51:395]: Failed to open image file: C:\Users\gd\Documents\Aerosoft\Airbus\MCDU_Dspl.png. [15/05/2015 14:03:51:396]: Webserver (CurrentRequest) thread finished. [15/05/2015 14:03:51:453]: Socket accepted: 0x4A0. [15/05/2015 14:03:51:453]: Webserver (CurrentRequest) thread started. [15/05/2015 14:03:51:454]: Failed to open image file: C:\Users\gd\Documents\Aerosoft\Airbus\MCDU_Dspl.png. [15/05/2015 14:03:51:454]: Webserver (CurrentRequest) thread finished. [15/05/2015 14:03:51:498]: Socket accepted: 0x49C. [15/05/2015 14:03:51:498]: Webserver (CurrentRequest) thread started. [15/05/2015 14:03:51:499]: Failed to open image file: C:\Users\gd\Documents\Aerosoft\Airbus\MCDU_Dspl.png. [15/05/2015 14:03:51:499]: Webserver (CurrentRequest) thread finished. [15/05/2015 14:03:51:543]: Socket accepted: 0x41C. [15/05/2015 14:03:51:543]: Webserver (CurrentRequest) thread started. [15/05/2015 14:03:51:544]: Failed to open image file: C:\Users\gd\Documents\Aerosoft\Airbus\MCDU_Dspl.png. [15/05/2015 14:03:51:544]: Webserver (CurrentRequest) thread finished. [15/05/2015 14:03:51:588]: Socket accepted: 0x49C. [15/05/2015 14:03:51:588]: Webserver (CurrentRequest) thread started. [15/05/2015 14:03:51:589]: Failed to open image file: C:\Users\gd\Documents\Aerosoft\Airbus\MCDU_Dspl.png. [15/05/2015 14:03:51:589]: Webserver (CurrentRequest) thread finished. [15/05/2015 14:03:51:633]: Socket accepted: 0x4A0. [15/05/2015 14:03:51:633]: Webserver (CurrentRequest) thread started. [15/05/2015 14:03:51:633]: Failed to open image file: C:\Users\gd\Documents\Aerosoft\Airbus\MCDU_Dspl.png. [15/05/2015 14:03:51:634]: Webserver (CurrentRequest) thread finished. [15/05/2015 14:03:51:677]: Socket accepted: 0x4AC. [15/05/2015 14:03:51:677]: Webserver (CurrentRequest) thread started. [15/05/2015 14:03:51:678]: Failed to open image file: C:\Users\gd\Documents\Aerosoft\Airbus\MCDU_Dspl.png. [15/05/2015 14:03:51:678]: Webserver (CurrentRequest) thread finished. [15/05/2015 14:03:51:722]: Socket accepted: 0x428. [15/05/2015 14:03:51:722]: Webserver (CurrentRequest) thread started. [15/05/2015 14:03:51:723]: Failed to open image file: C:\Users\gd\Documents\Aerosoft\Airbus\MCDU_Dspl.png. [15/05/2015 14:03:51:723]: Webserver (CurrentRequest) thread finished. [15/05/2015 14:03:51:767]: Socket accepted: 0x3A8. [15/05/2015 14:03:51:767]: Webserver (CurrentRequest) thread started. [15/05/2015 14:03:51:767]: Failed to open image file: C:\Users\gd\Documents\Aerosoft\Airbus\MCDU_Dspl.png. [15/05/2015 14:03:51:768]: Webserver (CurrentRequest) thread finished. [15/05/2015 14:03:51:811]: Socket accepted: 0x49C. [15/05/2015 14:03:51:811]: Webserver (CurrentRequest) thread started. [15/05/2015 14:03:51:812]: Failed to open image file: C:\Users\gd\Documents\Aerosoft\Airbus\MCDU_Dspl.png. [15/05/2015 14:03:51:812]: Webserver (CurrentRequest) thread finished. [15/05/2015 14:03:51:855]: Socket accepted: 0x4AC. [15/05/2015 14:03:51:855]: Webserver (CurrentRequest) thread started. [15/05/2015 14:03:51:856]: Failed to open image file: C:\Users\gd\Documents\Aerosoft\Airbus\MCDU_Dspl.png. [15/05/2015 14:03:51:856]: Webserver (CurrentRequest) thread finished. [15/05/2015 14:03:51:895]: Socket accepted: 0x49C. [15/05/2015 14:03:51:895]: Webserver (CurrentRequest) thread started. [15/05/2015 14:03:51:896]: Failed to open image file: C:\Users\gd\Documents\Aerosoft\Airbus\MCDU_Dspl.png. [15/05/2015 14:03:51:896]: Webserver (CurrentRequest) thread finished. [15/05/2015 14:03:51:900]: Socket accepted: 0x4B0. [15/05/2015 14:03:51:900]: Webserver (CurrentRequest) thread started. [15/05/2015 14:03:51:901]: Failed to open image file: C:\Users\gd\Documents\Aerosoft\Airbus\MCDU_Dspl.png. [15/05/2015 14:03:51:901]: Webserver (CurrentRequest) thread finished. [15/05/2015 14:03:51:940]: Socket accepted: 0x3A8. [15/05/2015 14:03:51:940]: Webserver (CurrentRequest) thread started. [15/05/2015 14:03:51:941]: Failed to open image file: C:\Users\gd\Documents\Aerosoft\Airbus\MCDU_Dspl.png. [15/05/2015 14:03:51:941]: Webserver (CurrentRequest) thread finished. [15/05/2015 14:03:51:946]: Socket accepted: 0x4B0. [15/05/2015 14:03:51:946]: Webserver (CurrentRequest) thread started. [15/05/2015 14:03:51:947]: Failed to open image file: C:\Users\gd\Documents\Aerosoft\Airbus\MCDU_Dspl.png. [15/05/2015 14:03:51:947]: Webserver (CurrentRequest) thread finished. [15/05/2015 14:03:51:990]: Socket accepted: 0x4A0. [15/05/2015 14:03:51:990]: Webserver (CurrentRequest) thread started. [15/05/2015 14:03:51:991]: Failed to open image file: C:\Users\gd\Documents\Aerosoft\Airbus\MCDU_Dspl.png. [15/05/2015 14:03:51:991]: Webserver (CurrentRequest) thread finished. [15/05/2015 14:03:52:035]: Socket accepted: 0x4A0. [15/05/2015 14:03:52:035]: Webserver (CurrentRequest) thread started. [15/05/2015 14:03:52:036]: Failed to open image file: C:\Users\gd\Documents\Aerosoft\Airbus\MCDU_Dspl.png. [15/05/2015 14:03:52:036]: Webserver (CurrentRequest) thread finished. [15/05/2015 14:03:52:082]: Socket accepted: 0x4A0. [15/05/2015 14:03:52:082]: Webserver (CurrentRequest) thread started. [15/05/2015 14:03:52:083]: Failed to open image file: C:\Users\gd\Documents\Aerosoft\Airbus\MCDU_Dspl.png. [15/05/2015 14:03:52:083]: Webserver (CurrentRequest) thread finished. [15/05/2015 14:03:52:127]: Socket accepted: 0x49C. [15/05/2015 14:03:52:127]: Webserver (CurrentRequest) thread started. [15/05/2015 14:03:52:127]: Failed to open image file: C:\Users\gd\Documents\Aerosoft\Airbus\MCDU_Dspl.png. [15/05/2015 14:03:52:127]: Webserver (CurrentRequest) thread finished. [15/05/2015 14:03:52:171]: Socket accepted: 0x49C. [15/05/2015 14:03:52:171]: Webserver (CurrentRequest) thread started. [15/05/2015 14:03:52:172]: Failed to open image file: C:\Users\gd\Documents\Aerosoft\Airbus\MCDU_Dspl.png. [15/05/2015 14:03:52:172]: Webserver (CurrentRequest) thread finished. [15/05/2015 14:03:52:216]: Socket accepted: 0x4A0. [15/05/2015 14:03:52:216]: Webserver (CurrentRequest) thread started. [15/05/2015 14:03:52:216]: Failed to open image file: C:\Users\gd\Documents\Aerosoft\Airbus\MCDU_Dspl.png. [15/05/2015 14:03:52:217]: Webserver (CurrentRequest) thread finished. [15/05/2015 14:03:52:261]: Socket accepted: 0x4A0. [15/05/2015 14:03:52:261]: Webserver (CurrentRequest) thread started. [15/05/2015 14:03:52:262]: Failed to open image file: C:\Users\gd\Documents\Aerosoft\Airbus\MCDU_Dspl.png. [15/05/2015 14:03:52:262]: Webserver (CurrentRequest) thread finished. [15/05/2015 14:03:52:307]: Socket accepted: 0x49C. [15/05/2015 14:03:52:307]: Webserver (CurrentRequest) thread started. [15/05/2015 14:03:52:307]: Failed to open image file: C:\Users\gd\Documents\Aerosoft\Airbus\MCDU_Dspl.png. [15/05/2015 14:03:52:307]: Webserver (CurrentRequest) thread finished. [15/05/2015 14:03:52:352]: Socket accepted: 0x4B0. [15/05/2015 14:03:52:352]: Webserver (CurrentRequest) thread started. [15/05/2015 14:03:52:353]: Failed to open image file: C:\Users\gd\Documents\Aerosoft\Airbus\MCDU_Dspl.png. [15/05/2015 14:03:52:353]: Webserver (CurrentRequest) thread finished. [15/05/2015 14:03:52:396]: Socket accepted: 0x4B4. [15/05/2015 14:03:52:396]: Webserver (CurrentRequest) thread started. [15/05/2015 14:03:52:397]: Failed to open image file: C:\Users\gd\Documents\Aerosoft\Airbus\MCDU_Dspl.png. [15/05/2015 14:03:52:397]: Webserver (CurrentRequest) thread finished. [15/05/2015 14:03:52:440]: Socket accepted: 0x4A0. [15/05/2015 14:03:52:440]: Webserver (CurrentRequest) thread started. [15/05/2015 14:03:52:441]: Failed to open image file: C:\Users\gd\Documents\Aerosoft\Airbus\MCDU_Dspl.png. [15/05/2015 14:03:52:441]: Webserver (CurrentRequest) thread finished. [15/05/2015 14:03:52:484]: Socket accepted: 0x4B4. [15/05/2015 14:03:52:484]: Webserver (CurrentRequest) thread started. [15/05/2015 14:03:52:485]: Failed to open image file: C:\Users\gd\Documents\Aerosoft\Airbus\MCDU_Dspl.png. [15/05/2015 14:03:52:485]: Webserver (CurrentRequest) thread finished. [15/05/2015 14:03:52:529]: Socket accepted: 0x38C. [15/05/2015 14:03:52:529]: Webserver (CurrentRequest) thread started. [15/05/2015 14:03:52:530]: Failed to open image file: C:\Users\gd\Documents\Aerosoft\Airbus\MCDU_Dspl.png. [15/05/2015 14:03:52:530]: Webserver (CurrentRequest) thread finished. [15/05/2015 14:03:52:574]: Socket accepted: 0x38C. [15/05/2015 14:03:52:574]: Webserver (CurrentRequest) thread started. [15/05/2015 14:03:52:574]: Failed to open image file: C:\Users\gd\Documents\Aerosoft\Airbus\MCDU_Dspl.png. [15/05/2015 14:03:52:575]: Webserver (CurrentRequest) thread finished. [15/05/2015 14:03:52:618]: Socket accepted: 0x4A0. [15/05/2015 14:03:52:618]: Webserver (CurrentRequest) thread started. [15/05/2015 14:03:52:619]: Failed to open image file: C:\Users\gd\Documents\Aerosoft\Airbus\MCDU_Dspl.png. [15/05/2015 14:03:52:619]: Webserver (CurrentRequest) thread finished. [15/05/2015 14:03:52:662]: Socket accepted: 0x49C. [15/05/2015 14:03:52:662]: Webserver (CurrentRequest) thread started. [15/05/2015 14:03:52:662]: Failed to open image file: C:\Users\gd\Documents\Aerosoft\Airbus\MCDU_Dspl.png. [15/05/2015 14:03:52:663]: Webserver (CurrentRequest) thread finished. [15/05/2015 14:03:52:707]: Socket accepted: 0x38C. [15/05/2015 14:03:52:707]: Webserver (CurrentRequest) thread started. [15/05/2015 14:03:52:708]: Failed to open image file: C:\Users\gd\Documents\Aerosoft\Airbus\MCDU_Dspl.png. [15/05/2015 14:03:52:708]: Webserver (CurrentRequest) thread finished. [15/05/2015 14:03:52:752]: Socket accepted: 0x4AC. [15/05/2015 14:03:52:752]: Webserver (CurrentRequest) thread started. [15/05/2015 14:03:52:752]: Failed to open image file: C:\Users\gd\Documents\Aerosoft\Airbus\MCDU_Dspl.png. [15/05/2015 14:03:52:753]: Webserver (CurrentRequest) thread finished. [15/05/2015 14:03:52:796]: Socket accepted: 0x38C. [15/05/2015 14:03:52:796]: Webserver (CurrentRequest) thread started. [15/05/2015 14:03:52:797]: Failed to open image file: C:\Users\gd\Documents\Aerosoft\Airbus\MCDU_Dspl.png. [15/05/2015 14:03:52:797]: Webserver (CurrentRequest) thread finished. [15/05/2015 14:03:52:841]: Socket accepted: 0x49C. [15/05/2015 14:03:52:841]: Webserver (CurrentRequest) thread started. [15/05/2015 14:03:52:842]: Failed to open image file: C:\Users\gd\Documents\Aerosoft\Airbus\MCDU_Dspl.png. [15/05/2015 14:03:52:842]: Webserver (CurrentRequest) thread finished. [15/05/2015 14:03:52:886]: Socket accepted: 0x4A0. [15/05/2015 14:03:52:886]: Webserver (CurrentRequest) thread started. [15/05/2015 14:03:52:886]: Failed to open image file: C:\Users\gd\Documents\Aerosoft\Airbus\MCDU_Dspl.png. [15/05/2015 14:03:52:887]: Webserver (CurrentRequest) thread finished. [15/05/2015 14:03:52:895]: Socket accepted: 0x49C. [15/05/2015 14:03:52:895]: Webserver (CurrentRequest) thread started. [15/05/2015 14:03:52:896]: Failed to open image file: C:\Users\gd\Documents\Aerosoft\Airbus\MCDU_Dspl.png. [15/05/2015 14:03:52:896]: Webserver (CurrentRequest) thread finished. [15/05/2015 14:03:52:931]: Socket accepted: 0x38C. [15/05/2015 14:03:52:931]: Webserver (CurrentRequest) thread started. [15/05/2015 14:03:52:932]: Failed to open image file: C:\Users\gd\Documents\Aerosoft\Airbus\MCDU_Dspl.png. [15/05/2015 14:03:52:932]: Webserver (CurrentRequest) thread finished. [15/05/2015 14:03:52:939]: Socket accepted: 0x38C. [15/05/2015 14:03:52:939]: Webserver (CurrentRequest) thread started. [15/05/2015 14:03:52:940]: Failed to open image file: C:\Users\gd\Documents\Aerosoft\Airbus\MCDU_Dspl.png. [15/05/2015 14:03:52:940]: Webserver (CurrentRequest) thread finished. [15/05/2015 14:03:52:976]: Socket accepted: 0x49C. [15/05/2015 14:03:52:976]: Webserver (CurrentRequest) thread started. [15/05/2015 14:03:52:977]: Failed to open image file: C:\Users\gd\Documents\Aerosoft\Airbus\MCDU_Dspl.png. [15/05/2015 14:03:52:977]: Webserver (CurrentRequest) thread finished. [15/05/2015 14:03:52:985]: Socket accepted: 0x2C4. [15/05/2015 14:03:52:985]: Webserver (CurrentRequest) thread started. [15/05/2015 14:03:52:985]: Failed to open image file: C:\Users\gd\Documents\Aerosoft\Airbus\MCDU_Dspl.png. [15/05/2015 14:03:52:986]: Webserver (CurrentRequest) thread finished. [15/05/2015 14:03:53:022]: Socket accepted: 0x4B0. [15/05/2015 14:03:53:022]: Webserver (CurrentRequest) thread started. [15/05/2015 14:03:53:023]: Failed to open image file: C:\Users\gd\Documents\Aerosoft\Airbus\MCDU_Dspl.png. [15/05/2015 14:03:53:023]: Webserver (CurrentRequest) thread finished. [15/05/2015 14:03:53:030]: Socket accepted: 0x2C4. [15/05/2015 14:03:53:030]: Webserver (CurrentRequest) thread started. [15/05/2015 14:03:53:030]: Failed to open image file: C:\Users\gd\Documents\Aerosoft\Airbus\MCDU_Dspl.png. [15/05/2015 14:03:53:031]: Webserver (CurrentRequest) thread finished. [15/05/2015 14:03:53:067]: Socket accepted: 0x49C. [15/05/2015 14:03:53:067]: Webserver (CurrentRequest) thread started. [15/05/2015 14:03:53:068]: Failed to open image file: C:\Users\gd\Documents\Aerosoft\Airbus\MCDU_Dspl.png. [15/05/2015 14:03:53:068]: Webserver (CurrentRequest) thread finished. [15/05/2015 14:03:53:074]: Socket accepted: 0x4B4. [15/05/2015 14:03:53:074]: Webserver (CurrentRequest) thread started. [15/05/2015 14:03:53:075]: Failed to open image file: C:\Users\gd\Documents\Aerosoft\Airbus\MCDU_Dspl.png. [15/05/2015 14:03:53:075]: Webserver (CurrentRequest) thread finished. [15/05/2015 14:03:53:111]: Socket accepted: 0x49C. [15/05/2015 14:03:53:111]: Webserver (CurrentRequest) thread started. [15/05/2015 14:03:53:112]: Failed to open image file: C:\Users\gd\Documents\Aerosoft\Airbus\MCDU_Dspl.png. [15/05/2015 14:03:53:112]: Webserver (CurrentRequest) thread finished. [15/05/2015 14:03:53:118]: Socket accepted: 0x42C. [15/05/2015 14:03:53:118]: Webserver (CurrentRequest) thread started. [15/05/2015 14:03:53:118]: Failed to open image file: C:\Users\gd\Documents\Aerosoft\Airbus\MCDU_Dspl.png. [15/05/2015 14:03:53:118]: Webserver (CurrentRequest) thread finished. [15/05/2015 14:03:53:157]: Socket accepted: 0x49C. [15/05/2015 14:03:53:157]: Webserver (CurrentRequest) thread started. [15/05/2015 14:03:53:157]: Failed to open image file: C:\Users\gd\Documents\Aerosoft\Airbus\MCDU_Dspl.png. [15/05/2015 14:03:53:158]: Webserver (CurrentRequest) thread finished. [15/05/2015 14:03:53:164]: Socket accepted: 0x49C. [15/05/2015 14:03:53:164]: Webserver (CurrentRequest) thread started. [15/05/2015 14:03:53:165]: Failed to open image file: C:\Users\gd\Documents\Aerosoft\Airbus\MCDU_Dspl.png. [15/05/2015 14:03:53:165]: Webserver (CurrentRequest) thread finished. [15/05/2015 14:03:53:203]: Socket accepted: 0x4B0. [15/05/2015 14:03:53:203]: Webserver (CurrentRequest) thread started. [15/05/2015 14:03:53:204]: Failed to open image file: C:\Users\gd\Documents\Aerosoft\Airbus\MCDU_Dspl.png. [15/05/2015 14:03:53:204]: Webserver (CurrentRequest) thread finished. [15/05/2015 14:03:53:209]: Socket accepted: 0x4B0. [15/05/2015 14:03:53:209]: Webserver (CurrentRequest) thread started. [15/05/2015 14:03:53:209]: Failed to open image file: C:\Users\gd\Documents\Aerosoft\Airbus\MCDU_Dspl.png. [15/05/2015 14:03:53:210]: Webserver (CurrentRequest) thread finished. [15/05/2015 14:03:53:248]: Socket accepted: 0x4B0. [15/05/2015 14:03:53:248]: Webserver (CurrentRequest) thread started. [15/05/2015 14:03:53:249]: Failed to open image file: C:\Users\gd\Documents\Aerosoft\Airbus\MCDU_Dspl.png. [15/05/2015 14:03:53:249]: Webserver (CurrentRequest) thread finished. [15/05/2015 14:03:53:253]: Socket accepted: 0x41C. [15/05/2015 14:03:53:253]: Webserver (CurrentRequest) thread started. [15/05/2015 14:03:53:253]: Failed to open image file: C:\Users\gd\Documents\Aerosoft\Airbus\MCDU_Dspl.png. [15/05/2015 14:03:53:253]: Webserver (CurrentRequest) thread finished. [15/05/2015 14:03:53:294]: Socket accepted: 0x49C. [15/05/2015 14:03:53:294]: Webserver (CurrentRequest) thread started. [15/05/2015 14:03:53:295]: Failed to open image file: C:\Users\gd\Documents\Aerosoft\Airbus\MCDU_Dspl.png. [15/05/2015 14:03:53:295]: Webserver (CurrentRequest) thread finished. [15/05/2015 14:03:53:298]: Socket accepted: 0x4B4. [15/05/2015 14:03:53:298]: Webserver (CurrentRequest) thread started. [15/05/2015 14:03:53:298]: Failed to open image file: C:\Users\gd\Documents\Aerosoft\Airbus\MCDU_Dspl.png. [15/05/2015 14:03:53:298]: Webserver (CurrentRequest) thread finished. [15/05/2015 14:03:53:342]: Socket accepted: 0x49C. [15/05/2015 14:03:53:342]: Webserver (CurrentRequest) thread started. [15/05/2015 14:03:53:343]: Failed to open image file: C:\Users\gd\Documents\Aerosoft\Airbus\MCDU_Dspl.png. [15/05/2015 14:03:53:343]: Webserver (CurrentRequest) thread finished. [15/05/2015 14:03:53:386]: Socket accepted: 0x2C4. [15/05/2015 14:03:53:386]: Webserver (CurrentRequest) thread started. [15/05/2015 14:03:53:387]: Failed to open image file: C:\Users\gd\Documents\Aerosoft\Airbus\MCDU_Dspl.png. [15/05/2015 14:03:53:387]: Webserver (CurrentRequest) thread finished. [15/05/2015 14:03:53:430]: Socket accepted: 0x4B0. [15/05/2015 14:03:53:431]: Webserver (CurrentRequest) thread started. [15/05/2015 14:03:53:431]: Failed to open image file: C:\Users\gd\Documents\Aerosoft\Airbus\MCDU_Dspl.png. [15/05/2015 14:03:53:431]: Webserver (CurrentRequest) thread finished. [15/05/2015 14:03:53:475]: Socket accepted: 0x4A0. [15/05/2015 14:03:53:475]: Webserver (CurrentRequest) thread started. [15/05/2015 14:03:53:475]: Failed to open image file: C:\Users\gd\Documents\Aerosoft\Airbus\MCDU_Dspl.png. [15/05/2015 14:03:53:475]: Webserver (CurrentRequest) thread finished. [15/05/2015 14:03:53:518]: Socket accepted: 0x494. [15/05/2015 14:03:53:519]: Webserver (CurrentRequest) thread started. [15/05/2015 14:03:53:519]: Failed to open image file: C:\Users\gd\Documents\Aerosoft\Airbus\MCDU_Dspl.png. [15/05/2015 14:03:53:519]: Webserver (CurrentRequest) thread finished. [15/05/2015 14:03:53:563]: Socket accepted: 0x38C. [15/05/2015 14:03:53:563]: Webserver (CurrentRequest) thread started. [15/05/2015 14:03:53:563]: Failed to open image file: C:\Users\gd\Documents\Aerosoft\Airbus\MCDU_Dspl.png. [15/05/2015 14:03:53:563]: Webserver (CurrentRequest) thread finished. [15/05/2015 14:03:53:607]: Socket accepted: 0x38C. [15/05/2015 14:03:53:607]: Webserver (CurrentRequest) thread started. [15/05/2015 14:03:53:607]: Failed to open image file: C:\Users\gd\Documents\Aerosoft\Airbus\MCDU_Dspl.png. [15/05/2015 14:03:53:607]: Webserver (CurrentRequest) thread finished. [15/05/2015 14:03:53:651]: Socket accepted: 0x2C4. [15/05/2015 14:03:53:651]: Webserver (CurrentRequest) thread started. [15/05/2015 14:03:53:652]: Failed to open image file: C:\Users\gd\Documents\Aerosoft\Airbus\MCDU_Dspl.png. [15/05/2015 14:03:53:652]: Webserver (CurrentRequest) thread finished. [15/05/2015 14:03:53:696]: Socket accepted: 0x4A0. [15/05/2015 14:03:53:696]: Webserver (CurrentRequest) thread started. [15/05/2015 14:03:53:696]: Failed to open image file: C:\Users\gd\Documents\Aerosoft\Airbus\MCDU_Dspl.png. [15/05/2015 14:03:53:696]: Webserver (CurrentRequest) thread finished. [15/05/2015 14:03:53:740]: Socket accepted: 0x4A0. [15/05/2015 14:03:53:740]: Webserver (CurrentRequest) thread started. [15/05/2015 14:03:53:740]: Failed to open image file: C:\Users\gd\Documents\Aerosoft\Airbus\MCDU_Dspl.png. [15/05/2015 14:03:53:740]: Webserver (CurrentRequest) thread finished. [15/05/2015 14:03:53:818]: Socket accepted: 0x49C. [15/05/2015 14:03:53:818]: Webserver (CurrentRequest) thread started. [15/05/2015 14:03:53:819]: Failed to open image file: C:\Users\gd\Documents\Aerosoft\Airbus\MCDU_Dspl.png. [15/05/2015 14:03:53:819]: Webserver (CurrentRequest) thread finished. [15/05/2015 14:03:53:877]: Socket accepted: 0x4B4. [15/05/2015 14:03:53:877]: Webserver (CurrentRequest) thread started. [15/05/2015 14:03:53:878]: Failed to open image file: C:\Users\gd\Documents\Aerosoft\Airbus\MCDU_Dspl.png. [15/05/2015 14:03:53:878]: Webserver (CurrentRequest) thread finished. [15/05/2015 14:03:53:897]: Socket accepted: 0x2C4. [15/05/2015 14:03:53:897]: Webserver (CurrentRequest) thread started. [15/05/2015 14:03:53:897]: Failed to open image file: C:\Users\gd\Documents\Aerosoft\Airbus\MCDU_Dspl.png. [15/05/2015 14:03:53:898]: Webserver (CurrentRequest) thread finished. [15/05/2015 14:03:53:923]: Socket accepted: 0x4A0. [15/05/2015 14:03:53:923]: Webserver (CurrentRequest) thread started. [15/05/2015 14:03:53:923]: Failed to open image file: C:\Users\gd\Documents\Aerosoft\Airbus\MCDU_Dspl.png. [15/05/2015 14:03:53:924]: Webserver (CurrentRequest) thread finished. [15/05/2015 14:03:53:960]: Socket accepted: 0x4A0. [15/05/2015 14:03:53:960]: Webserver (CurrentRequest) thread started. [15/05/2015 14:03:53:960]: Failed to open image file: C:\Users\gd\Documents\Aerosoft\Airbus\MCDU_Dspl.png. [15/05/2015 14:03:53:960]: Webserver (CurrentRequest) thread finished. [15/05/2015 14:03:53:976]: Socket accepted: 0x38C. [15/05/2015 14:03:53:976]: Webserver (CurrentRequest) thread started. [15/05/2015 14:03:53:977]: Failed to open image file: C:\Users\gd\Documents\Aerosoft\Airbus\MCDU_Dspl.png. [15/05/2015 14:03:53:977]: Webserver (CurrentRequest) thread finished. [15/05/2015 14:03:54:005]: Socket accepted: 0x49C. [15/05/2015 14:03:54:006]: Webserver (CurrentRequest) thread started. [15/05/2015 14:03:54:006]: Failed to open image file: C:\Users\gd\Documents\Aerosoft\Airbus\MCDU_Dspl.png. [15/05/2015 14:03:54:006]: Webserver (CurrentRequest) thread finished. [15/05/2015 14:03:54:021]: Socket accepted: 0x38C. [15/05/2015 14:03:54:021]: Webserver (CurrentRequest) thread started. [15/05/2015 14:03:54:021]: Failed to open image file: C:\Users\gd\Documents\Aerosoft\Airbus\MCDU_Dspl.png. [15/05/2015 14:03:54:022]: Webserver (CurrentRequest) thread finished. [15/05/2015 14:03:54:050]: Socket accepted: 0x2C4. [15/05/2015 14:03:54:050]: Webserver (CurrentRequest) thread started. [15/05/2015 14:03:54:051]: Failed to open image file: C:\Users\gd\Documents\Aerosoft\Airbus\MCDU_Dspl.png. [15/05/2015 14:03:54:051]: Webserver (CurrentRequest) thread finished. [15/05/2015 14:03:54:067]: Socket accepted: 0x3BC. [15/05/2015 14:03:54:067]: Webserver (CurrentRequest) thread started. [15/05/2015 14:03:54:067]: Failed to open image file: C:\Users\gd\Documents\Aerosoft\Airbus\MCDU_Dspl.png. [15/05/2015 14:03:54:067]: Webserver (CurrentRequest) thread finished. [15/05/2015 14:03:54:095]: Socket accepted: 0x2C4. [15/05/2015 14:03:54:095]: Webserver (CurrentRequest) thread started. [15/05/2015 14:03:54:096]: Failed to open image file: C:\Users\gd\Documents\Aerosoft\Airbus\MCDU_Dspl.png. [15/05/2015 14:03:54:096]: Webserver (CurrentRequest) thread finished. [15/05/2015 14:03:54:112]: Socket accepted: 0x3BC. [15/05/2015 14:03:54:112]: Webserver (CurrentRequest) thread started. [15/05/2015 14:03:54:112]: Failed to open image file: C:\Users\gd\Documents\Aerosoft\Airbus\MCDU_Dspl.png. [15/05/2015 14:03:54:112]: Webserver (CurrentRequest) thread finished. [15/05/2015 14:03:54:140]: Socket accepted: 0x3BC. [15/05/2015 14:03:54:140]: Webserver (CurrentRequest) thread started. [15/05/2015 14:03:54:140]: Failed to open image file: C:\Users\gd\Documents\Aerosoft\Airbus\MCDU_Dspl.png. [15/05/2015 14:03:54:141]: Webserver (CurrentRequest) thread finished. [15/05/2015 14:03:54:157]: Socket accepted: 0x4B0. [15/05/2015 14:03:54:157]: Webserver (CurrentRequest) thread started. [15/05/2015 14:03:54:158]: Failed to open image file: C:\Users\gd\Documents\Aerosoft\Airbus\MCDU_Dspl.png. [15/05/2015 14:03:54:158]: Webserver (CurrentRequest) thread finished. [15/05/2015 14:03:54:186]: Socket accepted: 0x38C. [15/05/2015 14:03:54:186]: Webserver (CurrentRequest) thread started. [15/05/2015 14:03:54:187]: Failed to open image file: C:\Users\gd\Documents\Aerosoft\Airbus\MCDU_Dspl.png. [15/05/2015 14:03:54:187]: Webserver (CurrentRequest) thread finished. [15/05/2015 14:03:54:202]: Socket accepted: 0x2C4. [15/05/2015 14:03:54:202]: Webserver (CurrentRequest) thread started. [15/05/2015 14:03:54:203]: Failed to open image file: C:\Users\gd\Documents\Aerosoft\Airbus\MCDU_Dspl.png. [15/05/2015 14:03:54:203]: Webserver (CurrentRequest) thread finished. [15/05/2015 14:03:54:231]: Socket accepted: 0x2C4. [15/05/2015 14:03:54:231]: Webserver (CurrentRequest) thread started. [15/05/2015 14:03:54:232]: Failed to open image file: C:\Users\gd\Documents\Aerosoft\Airbus\MCDU_Dspl.png. [15/05/2015 14:03:54:232]: Webserver (CurrentRequest) thread finished. [15/05/2015 14:03:54:246]: Socket accepted: 0x474. [15/05/2015 14:03:54:246]: Webserver (CurrentRequest) thread started. [15/05/2015 14:03:54:247]: Failed to open image file: C:\Users\gd\Documents\Aerosoft\Airbus\MCDU_Dspl.png. [15/05/2015 14:03:54:247]: Webserver (CurrentRequest) thread finished. 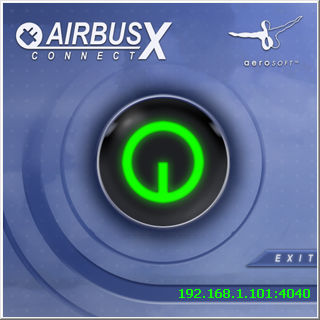 on my side, tested on flight LDSPLFMN but with AirbusXConnect A319. There, it works normally while I was flying on A320. It looks common but no answer here or anywhere else. And the missing file is nowhere on the aerosoft or fsx folders. Thanks for your help; that feature is great, I really would like to see it work! And you have done all that is explained in the start topic? HTML_Interface is set to 1. It really looks like it is searching for a picture file named MCDU_Dspl.png that does not exist though; At least not where it is supposed to be. Again, thanks for the aftersale help. Steps 1 to 6 run fine. I am still stuck with this issue. This topic, and another one in the forum show messages from people having this issue, and there is no troubleshoot anywhere (assuming all 6+1 steps of your explanation have been followed). I stumbled on this post and I thought to give it a try. Sometimes I also run MCDU via WebServer but haven’t since installing v 1.3 until now. First of all I have Airbus 318-319 and 320-321 and always have to run as Admin AirbusX-ConnectExtended from their respective “programs folder”. If you don’t run as Admin and not from their respective “programs folder” then everything works except step # 7 – MCDU is dark or displays default static page. 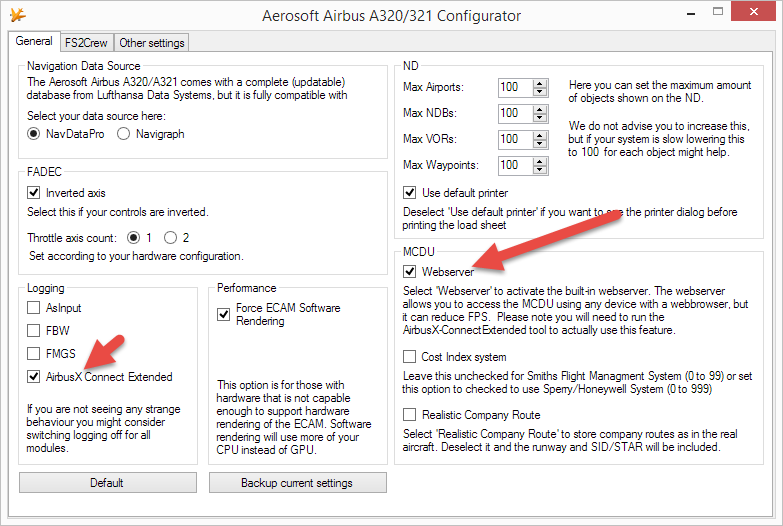 1) Appears it’s working with Airbus 318-319 AirbusX-ConnectExtended for both. 2) AirbusX-ConnectExtended from 320-321 I was able to only display MCDU info on iPad while provide inputs within FSX MCDU window with Airbus 32x. 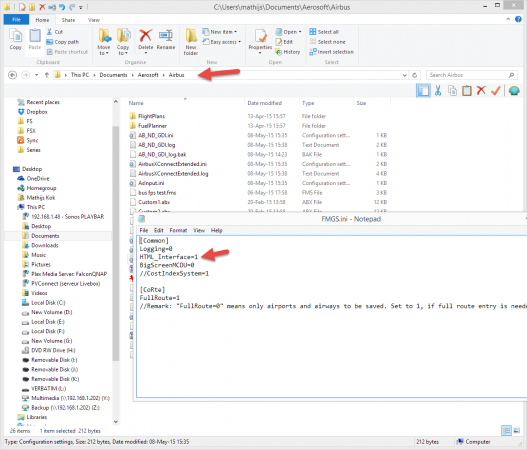 In both scenarios seems to work only for entire session together, cannot just exit ConnectExtended and the reopen. I had to exit ConnectExtended, then End Flight, then exit FSX and start from beginning. I would also like to claim this issue is effecting me also. Im running on P3d 2.5 with latest Airbus X SP3 installed. This did work for me once upon a time in FSX but only just trying it today again with both IPAD and as you suggested on the same client station, I receive nothing but an inoperative black screen once the FMGS page is selected. Hope this issue will continue to be reported as this is a great piece of kit when it is servicable! For the records, tried my firewall off also and still no joy. And HTML_Interface is set to 1. 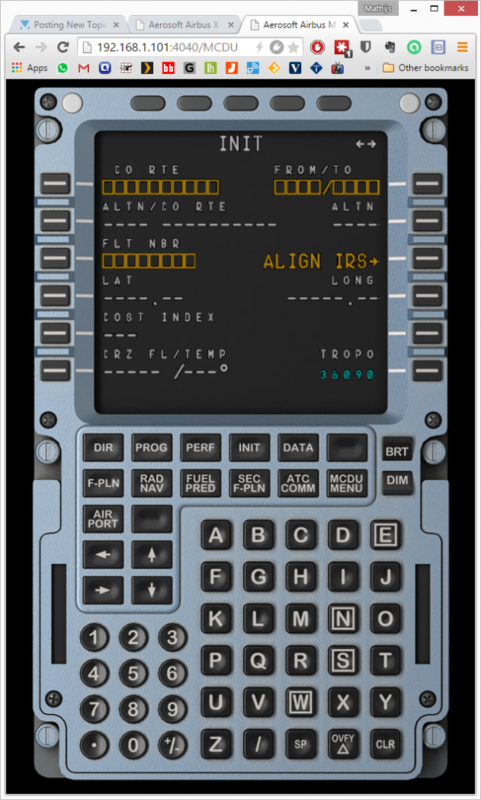 I have managed to get the A318/319 MCDU to operate on my tablet but the A320/321 does not. Will appear when you use the A320 model... However when using the A318, the aircraft is able to create the MCDU_Dspl.png file... and the MCDU will work properly. Im still not able to use version 1.4... Im using original version with administrator rights. I CORRECT.. Spelling on the A320 the MCDU info will NOT appear.. Probably should mention the A320 MCDU does disply on the tablet but is not operational, in other words does not reflect what is shown in FSX. I am able to pause FSX from the tablet when the MCDU is not displayed and can move backwards and forwards between displaying and not displaying it. I have tried using the browser on my networked machine with the same results. Well, the problem is still unsolved, and I am having doubts about aerosofts will to help customers. The forum was supposed to be the most effective way, and in the end, there is no reply at all, and I see I am not the only one struggling with the issue. Thanks to all of you who posted afterwards though. I still don't get why there should be a version for A318-A319 working fine and another not-working and not fixable for the A320-A321. Unfortunately I only paid for A320-A321. Well, I'll keep using F9+a while flying, and my iPad will stay off on the side. Too bad to know the thing exists, and to be unable to use it. i am in contact with the developer. 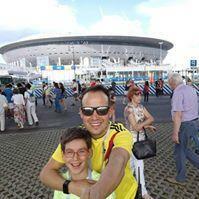 I will come back to you as soon as possible! im back with a question: Could you provide us the FMGS.log?